For the academic journal, see The Monist. Parmenides: Being or Reality is an unmoving perfect sphere, unchanging, undivided. 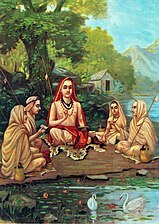 According to the Pāli Canon, both pluralism (nānatta) and monism (ekatta) are speculative views. 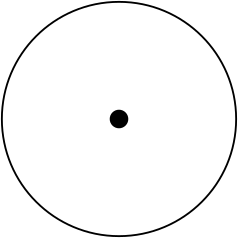 A Theravada commentary notes that the former is similar to or associated with nihilism (ucchēdavāda), and the latter is similar to or associated with eternalism (sassatavada). See middle way. In On Free Choice of the Will, Augustine argued, in the context of the problem of evil, that evil is not the opposite of good, but rather merely the absence of good, something that does not have existence in itself. Likewise, C. S. Lewis described evil as a "parasite" in Mere Christianity, as he viewed evil as something that cannot exist without good to provide it with existence. Lewis went on to argue against dualism from the basis of moral absolutism, and rejected the dualistic notion that God and Satan are opposites, arguing instead that God has no equal, hence no opposite. Lewis rather viewed Satan as the opposite of Michael the archangel. Due to this, Lewis instead argued for a more limited type of dualism. Other theologians, such as Greg Boyd, have argued in more depth that the Biblical authors held a "limited dualism", meaning that God and Satan do engage in real battle, but only due to free will given by God, for the duration that God allows. Some Christian theologians are avowed monists, such as Paul Tillich. Since God is he "in whom we live and move and have our being" (Book of Acts 17.28), it follows that everything that has being partakes in God..
God, the father is material. Jesus Christ is material. Angels are material. Spirits are material. Men are material. The universe is material ... Nothing exists which is not material." Vincent Cornell argues that the Quran provides a monist image of God by describing reality as a unified whole, with God being a single concept that would describe or ascribe all existing things. But most argue that Semitic religious scriptures, especially the Quran, see creation and God as two separate existences. It explains that everything has been created by God and is under his control, but at the same time distinguishes creation as being dependent on the existence of God. ^ For a discussion of the resultant paradox, see Tzimtzum. ^ See also Negative theology. ^ See the "Guide for the Perplexed", especially chapter I:50. ^ According to Renard, Alan Watts has explained the difference between "non-dualism" and "monism" in The Supreme Identity, Faber and Faber 1950, p.69 and 95; The Way of Zen, Pelican-edition 1976, p.59-60. According to Renard, Alan Watts has been one of the main contributors to thepopularisation of the notion of "nondualism". ^ a b c d e f Brugger 1972. ^ Cross & Livingstone 1974. ^ Chande 2000, p. 277. ^ Dasgupta 1992, p. 70. ^ a b "monism", Columbia Electronic Encyclopedia, 6th Edition. Retrieved 29 October 2014. 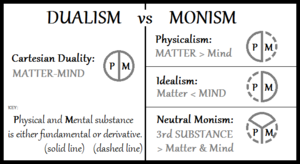 ^ a b c d e "Monism - By Branch / Doctrine - The Basics of Philosophy". Philosophybasics.com. Retrieved 24 January 2019. ^ Robert M. Young (1996). "The mind-body problem". In RC Olby; GN Cantor; JR Christie; MJS Hodges (eds.). Companion to the History of Modern Science (Paperback reprint of Routledge 1990 ed.). Taylor and Francis. pp. 702–11. ISBN 0415145783. ^ a b c d e f g h i Urmson 1991, p. 297. ^ Fiske 2010, p. 195. ^ Fiske 2010, p. 195-196. ^ Lenin, Vladimir (1909). Materialism and Empirio-criticism. World Socialist Web Site: Foreign Languages Publishing House. ^ Abernethy, Langford & pp.1-7. ^ Abernethy, Langford & pp.8,9. ^ Wonders of Life by Ernst Haeckel. ^ The Evolution of Man: A Popular Scientific Study, Volume 2 by Ernst Heinrich Philipp August Haeckel. ^ "Review: Giacomo Leopardi's 'Zibaldone'". Financial Times. 2013-08-16. Retrieved 2018-05-05. ^ The New Oxford Dictionary Of English. Oxford: Clarendon Press. 1998. p. 1341. ISBN 0-19-861263-X. ^ Picton, James Allanson (1905). Pantheism: its story and significance. Chicago: Archibald Constable & CO LTD. ISBN 978-1419140082. ^ a b Plumptre, Constance (1879). General sketch of the history of pantheism, Volume 2. London: Samuel Deacon and Co. pp. 3–5, 8, 29. ISBN 9780766155022. ^ Shoham, Schlomo Giora (2010). To Test the Limits of Our Endurance. Cambridge Scholars. p. 111. ISBN 1443820687. ^ Crosby, Donald A. (2008). Living with Ambiguity: Religious Naturalism and the Menace of Evil. New York: State University of New York Press. pp. 124. ISBN 0-7914-7519-0. ^ a b Erwin Fahlbusch; Geoffrey William Bromiley; David B. Barrett (1999). The Encyclopedia of Christianity pg. 21. Wm. B. Eerdmans Publishing. ISBN 0-8028-2416-1. ^ Whiting, Robert. Religions for Today Stanley Thomes (Publishers) Ltd. P. VIII. ISBN 0-7487-0586-4. ^ Sean F. Johnston (2009). The History of Science: A Beginner's Guide p. 90. ISBN 1-85168-681-9. ^ Alex Ashman, BBC News, "Metaphysical Isms". ^ a b Puligandla 1997, p. 50. ^ a b Rambachan 1994. ^ Renard 2010, p. 31. ^ Flood 1996, p. 239. ^ Momen 2009, p. 191. ^ a b Comans 1993. ^ Flood 1996, p. 257. ^ a b c Flood 1996, p. 258. ^ Flood 1996, p. 259. ^ Flood 1996, p. 85. ^ David Kalupahana, Causality: The Central Philosophy of Buddhism. The University Press of Hawaii, 1975, page 88. The passage is SN 2.77. ^ User, Super. "The Idea Of The Supreme Being (God) In Sikhism - Sikhism Articles - Gateway to Sikhism". Gateway to Sikhism. Retrieved 2017-12-14. ^ Gujral, Maninder S. "ATMA,". The Sikh Encyclopedia -ਸਿੱਖ ਧਰਮ ਵਿਸ਼ਵਕੋਸ਼. Retrieved 2017-12-14. ^ Singh, Jagraj (2009). A Complete Guide to Sikhism. Unistar Books. p. 266. ISBN 9788171427543. ^ "Chapter 2". Chabad.org. Retrieved 24 January 2019. ^ 1956-, Clayton, Philip,; Robert), Peacocke, A. R. (Arthur (2004). In whom we live and move and have our being : panentheistic reflections on God's presence in a scientific world. William B. Eerdmans Pub. ISBN 0802809782. OCLC 53880197. ^ Terryl,, Givens,. Wrestling the angel : the foundations of Mormon thought : cosmos, God, humanity. Oxford. ISBN 9780199794928. OCLC 869757526. ^ Yusuf, Hamza (2009). The Creed of Imam al-Tahawi. ^ "Cyprian Rice (1964) The Persian Sufism George Allen, London". Archived from the original on 2008-05-16. Retrieved 2008-07-04. ^ Daphne Daume; Louise Watson, eds. (1992). "The Bahá'í Faith". Britannica Book of the Year. Chicago: Encyclopædia Britannica. ISBN 0-85229-486-7. ^ Momen, Moojan (1988). Studies in the Bábí and Bahá’í Religions vol. 5, chapter: A Basis For Bahá’í Metaphysics. Kalimat Press. pp. 185–217. ISBN 0-933770-72-3. ^ "Pantheism and Panentheism | Encyclopedia.com". Encyclopedia.com. Retrieved 2019-01-19. ^ "Perennial Wisdom". Theosociety.org. Retrieved 2019-01-19. ^ "Loving the World as Our Own Body: The Nondualist Ethics of Taoism, Buddhism and Deep Ecology". enlight.lib.ntu.edu.tw. Retrieved 2019-01-19. ^ Noesta, Waldo (2017-09-19). "Pantheism = Applied Non-Duality". Pantheism.com. Retrieved 2019-01-19. ^ Christensen, Jeanne (2014-02-14). Rastafari Reasoning and the RastaWoman: Gender Constructions in the Shaping of Rastafari Livity. Lexington Books. ISBN 9780739175743.